The bacteria used in the experiment are anaerobic, which means they are adapted to live in environments without oxygen. The suit—a patchwork of mesh-like pieces called a metal-organic framework, or MOF—is impermeable to oxygen and reactive oxygen molecules, like peroxide, which shorten their lifespan. The suit is made of a MOF mesh that wraps around the bacteria, covering it in patches. 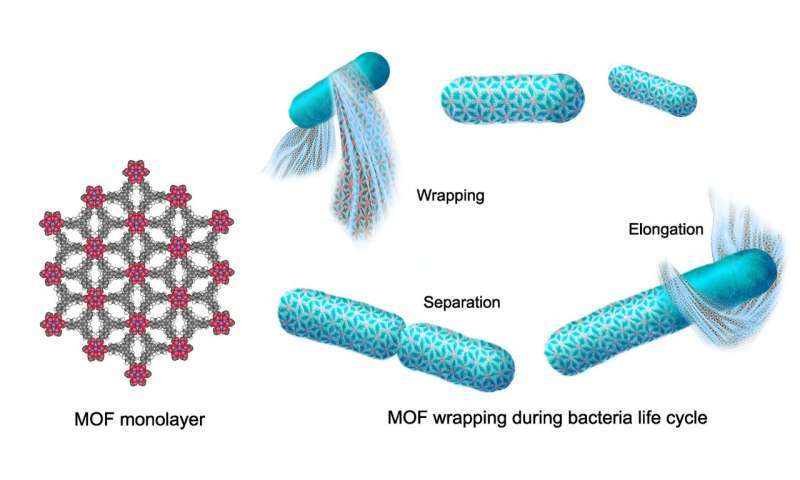 Wearing these MOF suits, the bacteria live five times longer at normal oxygen concentrations—21 percent by volume—than without the suits, and often longer than in their natural environment, Yang said. Their normal lifespan ranges from weeks to months, after which they can be flushed from the system and replaced with a fresh batch. "You can think of the 2-D MOF like a sheet of graphene: a one-layer-thick cloak that covers the bacteria," said co-author Omar Yaghi, a pioneer of MOFs and the James and Neeltje Tretter Chair in the Department of Chemistry. "The 2-D MOF is floating in solution with the bacteria, and as the bacteria replicate they are covered further with the 2-D MOF layer, so it protects the bacteria from oxygen." "Once you fix or activate CO2—and that is the most difficult part—you can use many existing chemical and biological approaches to upgrade them to fuels, pharmaceuticals and commodity chemicals," he said.